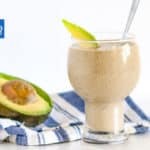 This deliciously "thick" Chocolate and Avocado Keto Shake is a great way to get a good dose of collagen protein, essential fats, and potassium while staying low-carb and low calorie. For a thicker consistency put the Shake in the fridge for half an hour while the Chia Seeds absorb the liquid. If you leave it too long you may need a spoon.